“DISTRICT ROLL OF HONOUR.” Hamilton Spectator (Vic. : 1870 – 1918) 23 Dec 1915: 6. Web.<http://nla.gov.au/nla.news-article120408257&gt;. Alfred John Jaffray was born on 4 July 1883 at Hamilton. His parents were John Jaffray and Rebecca Rayner of Wallacedale. Young Alfred attended Hamilton State School and then the Western District Academy at Hamilton Around 1903, he joined the Hamilton branch of the Mounted Rifles. Good mates with Ted Henty, also of Hamilton, the two friends applied for the first contingent overseas, only to have their applications rejected. They applied for the second contingent and were both successful. Ted went with the 8th Light Horse Regiment (LHR) and Alfred with the 9th LHR. Alfred entered with a rank of 2nd Lieutenant (2nd Lt.). Alfred left Australia on 11 February 1915 for Egypt. By May, the 9th LHR were off to Gallipoli as part of the 3rd Light Horse Brigade. Once there, Alfred was promoted to Captain (Capt). During July, he fell sick and was transferred to a hospital ship to Malta. Alfred recovered and soon returned to Gallipoli. His regiment was fortunate in that they were the reserve regiment for the Charge at The Nek on 7 August 1915 that devastated the 8th LHR and claimed the life of Alfred’s mate from Hamilton Ted Henty. However, the 9th was involved in the attack on Hill 60 at the end of August. Half of the regiment was wounded or killed as a result of that attack. 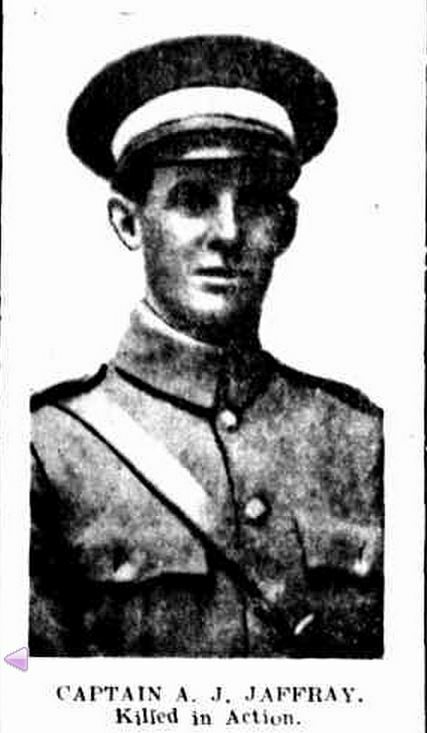 One of those was Alfred Jaffray, killed on 29 August 1915. 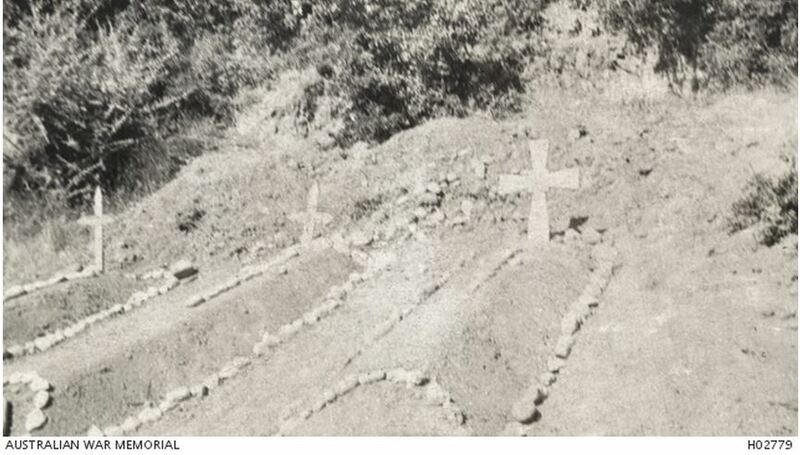 The following image from the Australian War Memorial shows the graves of 2nd Lt. William Cameron, Lieutenant-Colonel (Lt. Col.) Carew Reynell and Capt. Alfred John Jaffray, all from 9th LHR. Alfred’s service record includes letters backwards and forwards between Alfred’s father John and the Defence Department about the location of the grave. John was surprised that it was so difficult to find the grave, although further into his letter he did accept that further shelling may have destroyed it. 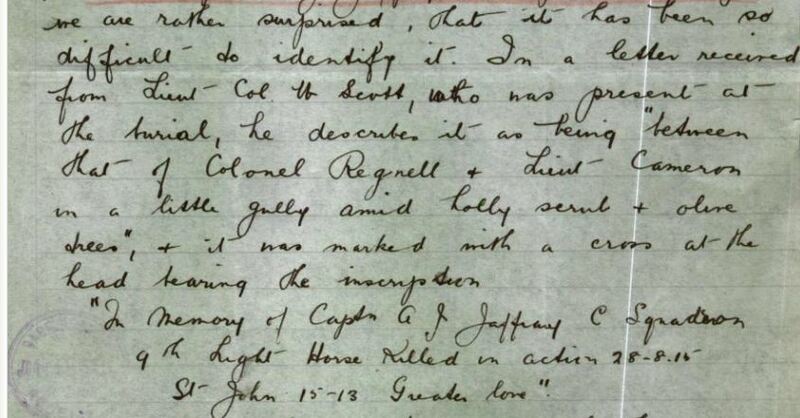 He had received a letter from Lt. Col. Scott who saw the burial and he gave John a description of the grave, the only thing he had to hang on to. The correspondence concluded with the assumption that the Alfred was buried somewhere in the Hill 60 cemetery but the exact location was unclear. If only John Jaffray could have seen the photo of his son’s grave. A memorial service was held in the Wallacedale Presbyterian Church on 19 September 1915 for Alfred and other lost local boys. Also, as a student of Hamilton State School and the Western District Academy, a tree was planted for Alfred along Hamilton’s Anzac Avenue.